AN INTELLIGENT SOFTWARE-DEFINED STORAGE SOLUTION, POWERED BY CEPH TECHNOLOGY, WHICH ENABLES YOU TO TRANSFORM YOUR ENTERPRISE STORAGE INFRASTRUCTURE. Providing IT organizations with a simple to manage, agile infrastructure with increased speed of delivery, durability and reliability. Accelerate innovation, reduce costs and alleviate proprietary hardware lock-in by transforming your enterprise storage infrastructure with a truly open, and unified intelligent software-defined storage solution. Let SUSE and our partners provide you with the most flexible enterprise-grade storage solution. Unlimited scalability with a distributed storage cluster designed to scale to thousands of nodes and multi-hundred petabyte environments and beyond to meet your growing data requirements. 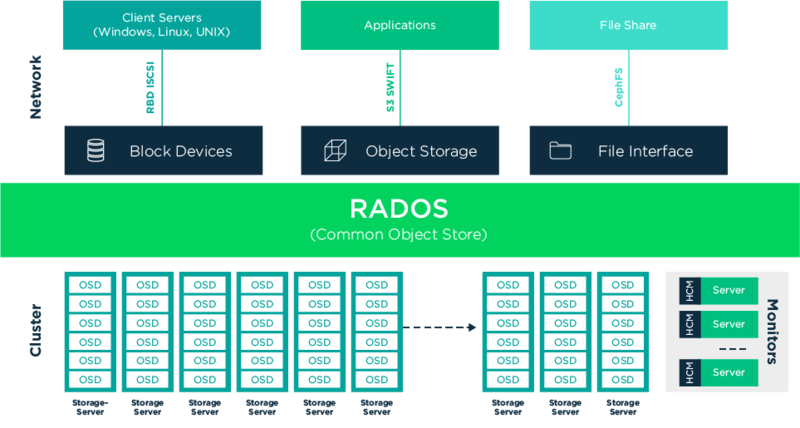 A single truly unified software-defined storage clusterthat provides applications with object, block and filesystem storage providing ubiquitous and universal access to your legacy and modern applications and automated durability of your data with high availability and disaster recovery options. Highly redundant storage infrastructure design maximizes application availability with no single points of failure. Self-healing capabilities minimize storage administration involvement and optimize data placement, enabling rapid reconstruction of redundancy, maximizing system resiliency and availability. Automated re-balancing and optimized data placement with an easy to manage intelligent solution that continuously monitors data utilization and infrastructure without any manual intervention and without growing IT staff.